Our history begins back in 1985, when A/C Equipment, Inc., created a compressor division. Located in Dallas, Texas, the division began its modest journey with sales of $25,000 in the first year of operation. Over the next few years, the compressor division established itself as a major competitor in the HVAC/R industry, with millions of dollars in annual revenue. On February 27, 1997, a small group of employees purchased the division, renaming it Compressors Unlimited. Currently, Compressors Unlimited specializes in remanufacturing compressors for air conditioning and refrigeration systems. The compressor brands that we remanufacture include Carrier/Carlyle, Copeland, Trane, and York. Our company objective has always been to provide our beloved customers with products that meet their needs and exceed their expectations. Since our mission is to remain the first choice for compressor replacements, we work very hard, every single day, to provide a large inventory of reliable, high-quality products and exceptional customer service. At Compressors Unlimited, we are aware of the fact that successful compressor remanufacturing is not a matter of chance; it is completely in the hands of our experienced professionals. To assure products of the highest quality, our remanufacturing process involves strict quality control standards, inspection procedures, and rigorous testing. Thanks to our technical knowledge, practical experience, precision, and thoroughness, our remanufactured compressors deliver like-new performance and durability, while providing substantial savings. Compressors Unlimited remanufactures various compressor models and maintains a large inventory of new compressors, spare parts, and accessories. As a result, we often supply compressor replacements, spare parts, and accessories off the shelf within several business hours after our customers submit their orders. If we don’t have the compressor and/or the compressor core that you need in stock, we can remanufacture and return your own compressor in a matter of days. We also accept used compressors in exchange, provided they are still in good shape and can be remanufactured. And to make things easier for our customers, all of our compressors are in pristine condition and ready for installation. This means that they can be installed as soon as the previous compressors are removed. Additionally, Compressors Unlimited can supply different compressor parts and accessories that you might need for your HVAC and refrigeration systems. If a particular item is out of stock, we can usually ship that part to you within several business days. Because downtime due to compressor malfunction can lead to significant revenue loss and bad business reputation, implicitly, fast and reliable service has become a priority at Compressors Unlimited. Shipping from our Dallas-based facility is also excellent. Within the U.S., we can often respond to an order overnight! International orders reach their final destination within days of completing the customs process. Need help picking the right compressor, part or accessory? Our friendly staff will be more than happy to assist you! With our large inventory of in-stock supplies and compressors, we are the #1 dealer of remanufactured compressors! Our dedicated customer service and sales teams are always available to provide professional advice about the compressors, parts, and accessories we provide. Please don’t hesitate to call us at 972-286-2264, and our friendly and professional staff will be more than happy to assist you. David has been working with commercial compressors for over 20 years. He is the one that makes things happen. David ensures our clients know how and when their compressors will arrive as well as various other duties that keep Compressors Unlimited International moving forward. 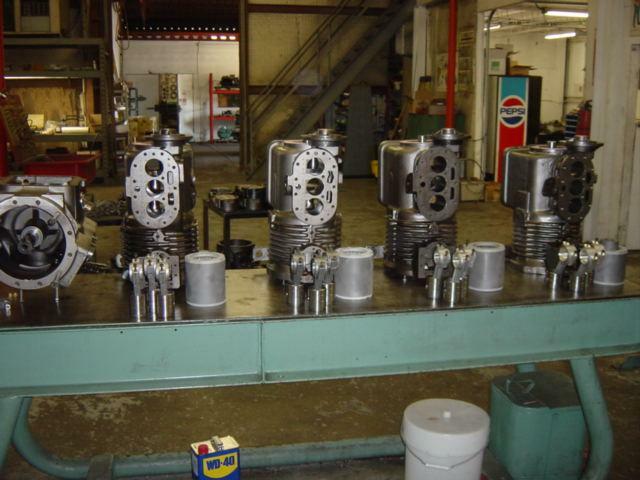 Bob has been building and reconstructing commercial compressors for over 25 years. Bob primarily builds the larger Trane Screw type compressors at Compressors Unlimited International. When Bob is not working on compressors he is working with our clients to answer various questions they may have. Brian has over 35 years of building commercial compressors. Compressors Unlimited International appreciates the wealth of knowledge he brings to the company.